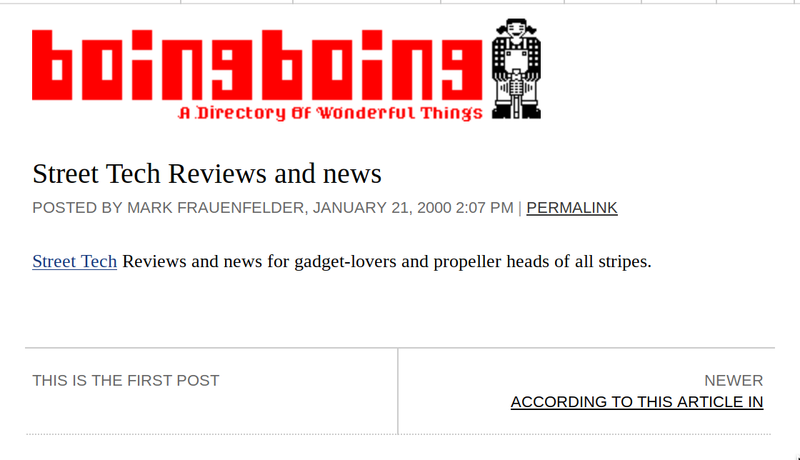 Nineteen years ago today, Mark decided to do some research on the new Blogger service for an article in The Industry Standard, and so he created a blog and started posting to it (the Standard spiked the story, on the basis that blogging was probably a passing fad). Less than a year later, I started a stint as a guestblogger that is still going, more than 18 years later. David came on board a couple months after me, and Xeni's guestblogging stint started late the next year and, like mine, never ended; Rob kicked off in 2005, and Jason's first post was in 2010, tho he joined us in 2006. And now we are 19, and old, and still weird, but the internet is less weird in some important ways ("a group of five websites, each consisting of screenshots of text from the other four").